This article is about the form of drama based on human suffering. For the loss of life, see Tragedy (event). For other uses, see Tragedy (disambiguation). "Tragedian" redirects here. For other uses, see Tragedian (disambiguation). Tragedy (from the Greek: τραγῳδία, tragōidia[a]) is a form of drama based on human suffering that invokes an accompanying catharsis or pleasure in audiences. While many cultures have developed forms that provoke this paradoxical response, the term tragedy often refers to a specific tradition of drama that has played a unique and important role historically in the self-definition of Western civilisation. That tradition has been multiple and discontinuous, yet the term has often been used to invoke a powerful effect of cultural identity and historical continuity—"the Greeks and the Elizabethans, in one cultural form; Hellenes and Christians, in a common activity," as Raymond Williams puts it. From its origins in the theatre of ancient Greece 2500 years ago, from which there survives only a fraction of the work of Aeschylus, Sophocles and Euripides, as well as a large number of fragments from other poets; through its singular articulations in the works of Shakespeare, Lope de Vega, Jean Racine, and Friedrich Schiller to the more recent naturalistic tragedy of August Strindberg; Samuel Beckett's modernist meditations on death, loss and suffering; Müller's postmodernist reworkings of the tragic canon, tragedy has remained an important site of cultural experimentation, negotiation, struggle, and change. A long line of philosophers—which includes Plato, Aristotle, Saint Augustine, Voltaire, Hume, Diderot, Hegel, Schopenhauer, Kierkegaard, Nietzsche, Freud, Benjamin, Camus, Lacan, and Deleuze—have analysed, speculated upon, and criticised the genre. In the wake of Aristotle's Poetics (335 BCE), tragedy has been used to make genre distinctions, whether at the scale of poetry in general (where the tragic divides against epic and lyric) or at the scale of the drama (where tragedy is opposed to comedy). In the modern era, tragedy has also been defined against drama, melodrama, the tragicomic, and epic theatre. Drama, in the narrow sense, cuts across the traditional division between comedy and tragedy in an anti- or a-generic deterritorialisation from the mid-19th century onwards. Both Bertolt Brecht and Augusto Boal define their epic theatre projects (non-Aristotelian drama and Theatre of the Oppressed, respectively) against models of tragedy. Taxidou, however, reads epic theatre as an incorporation of tragic functions and its treatments of mourning and speculation. The word "tragedy" appears to have been used to describe different phenomena at different times. It derives from Classical Greek τραγῳδία, contracted from trag(o)-aoidiā = "goat song", which comes from tragos = "he-goat" and aeidein = "to sing" (cf. "ode"). Scholars suspect this may be traced to a time when a goat was either the prize in a competition of choral dancing or was that around which a chorus danced prior to the animal's ritual sacrifice. In another view on the etymology, Athenaeus of Naucratis (2nd–3rd century CE) says that the original form of the word was trygodia from trygos (grape harvest) and ode (song), because those events were first introduced during grape harvest. There is some dissent to the dithyrambic origins of tragedy, mostly based on the differences between the shapes of their choruses and styles of dancing. [citation needed] A common descent from pre-Hellenic fertility and burial rites has been suggested. [citation needed] Friedrich Nietzsche discussed the origins of Greek tragedy in his early book The Birth of Tragedy (1872). Here, he suggests the name originates in the use of a chorus of goat-like satyrs in the original dithyrambs from which the tragic genre developed. Athenian tragedies were performed in late March/early April at an annual state religious festival in honor of Dionysus. The presentations took the form of a contest between three playwrights, who presented their works on three successive days. Each playwright offered a tetralogy consisting of three tragedies and a concluding comic piece called a satyr play. The four plays sometimes featured linked stories. Only one complete trilogy of tragedies has survived, the Oresteia of Aeschylus. The Greek theatre was in the open air, on the side of a hill, and performances of a trilogy and satyr play probably lasted most of the day. Performances were apparently open to all citizens, including women, but evidence is scant. [citation needed] The theatre of Dionysus at Athens probably held around 12,000 people. All of the choral parts were sung (to the accompaniment of an aulos) and some of the actors' answers to the chorus were sung as well. The play as a whole was composed in various verse metres. All actors were male and wore masks. A Greek chorus danced as well as sang, though no one knows exactly what sorts of steps the chorus performed as it sang. 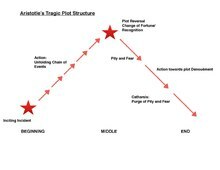 Choral songs in tragedy are often divided into three sections: strophe ("turning, circling"), antistrophe ("counter-turning, counter-circling") and epode ("after-song"). Following the expansion of the Roman Republic (509–27 BCE) into several Greek territories between 270–240 BCE, Rome encountered Greek tragedy. From the later years of the republic and by means of the Roman Empire (27 BCE-476 CE), theatre spread west across Europe, around the Mediterranean and even reached England. While Greek tragedy continued to be performed throughout the Roman period, the year 240 BCE marks the beginning of regular Roman drama. [d] Livius Andronicus began to write Roman tragedies, thus creating some of the first important works of Roman literature. Five years later, Gnaeus Naevius also began to write tragedies (though he was more appreciated for his comedies). No complete early Roman tragedy survives, though it was highly regarded in its day; historians know of three other early tragic playwrights—Quintus Ennius, Marcus Pacuvius and Lucius Accius. From the time of the empire, the tragedies of two playwrights survive—one is an unknown author, while the other is the Stoic philosopher Seneca. Nine of Seneca's tragedies survive, all of which are fabula crepidata (tragedies adapted from Greek originals); his Phaedra, for example, was based on Euripides' Hippolytus. Historians do not know who wrote the only extant example of the fabula praetexta (tragedies based on Roman subjects), Octavia, but in former times it was mistakenly attributed to Seneca due to his appearance as a character in the tragedy. Seneca's tragedies rework those of all three of the Athenian tragic playwrights whose work has survived. Probably meant to be recited at elite gatherings, they differ from the Greek versions in their long declamatory, narrative accounts of action, their obtrusive moralising, and their bombastic rhetoric. They dwell on detailed accounts of horrible deeds and contain long reflective soliloquies. Though the gods rarely appear in these plays, ghosts and witches abound. Senecan tragedies explore ideas of revenge, the occult, the supernatural, suicide, blood and gore. The Renaissance scholar Julius Caesar Scaliger (1484–1558), who knew both Latin and Greek, preferred Seneca to Euripides. Classical Greek drama was largely forgotten in Western Europe from the Middle Ages to the beginning of the 16th century. Medieval theatre was dominated by mystery plays, morality plays, farces and miracle plays. In Italy, the models for tragedy in the later Middle Ages were Roman, particularly the works of Seneca, interest in which was reawakened by the Paduan Lovato de' Lovati (1241–1309). His pupil Albertino Mussato (1261–1329), also of Padua, in 1315 wrote the Latin verse tragedy Eccerinis, which uses the story of the tyrant Ezzelino III da Romano to highlight the danger to Padua posed by Cangrande della Scala of Verona. It was the first secular tragedy written since Roman times, and may be considered the first Italian tragedy identifiable as a Renaissance work. The earliest tragedies to employ purely classical themes are the Achilles written before 1390 by Antonio Loschi of Vicenza (c.1365–1441) and the Progne of the Venetian Gregorio Correr (1409–1464) which dates from 1428–29. In 1515 Gian Giorgio Trissino (1478–1550) of Vicenza wrote his tragedy Sophonisba in the vernacular that would later be called Italian. Drawn from Livy's account of Sophonisba, the Carthaginian princess who drank poison to avoid being taken by the Romans, it adheres closely to classical rules. It was soon followed by the Oreste and Rosmunda of Trissino's friend, the Florentine Giovanni di Bernardo Rucellai (1475–1525). Both were completed by early 1516 and are based on classical Greek models, Rosmunda on the Hecuba of Euripides, and Oreste on the Iphigenia in Tauris of the same author; like Sophonisba, they are in Italian and in blank (unrhymed) hendecasyllables. Another of the first of all modern tragedies is A Castro, by Portuguese poet and playwright António Ferreira, written around 1550 (but only published in 1587) in polymetric verse (most of it being blank hendecasyllables), dealing with the murder of Inês de Castro, one of the most dramatic episodes in Portuguese history. Although these three Italian plays are often cited, separately or together, as being the first regular tragedies in modern times, as well as the earliest substantial works to be written in blank hendecasyllables, they were apparently preceded by two other works in the vernacular: Pamfila or Filostrato e Panfila written in 1498 or 1508 by Antonio Cammelli (Antonio da Pistoia); and a Sophonisba by Galeotto del Carretto of 1502. The most important sources for French tragic theatre in the Renaissance were the example of Seneca and the precepts of Horace and Aristotle (and contemporary commentaries by Julius Caesar Scaliger and Lodovico Castelvetro), although plots were taken from classical authors such as Plutarch, Suetonius, etc., from the Bible, from contemporary events and from short story collections (Italian, French and Spanish). The Greek tragic authors (Sophocles and Euripides) would become increasingly important as models by the middle of the 17th century. Important models were also supplied by the Spanish Golden Age playwrights Pedro Calderón de la Barca, Tirso de Molina and Lope de Vega, many of whose works were translated and adapted for the French stage. Contemporary with Shakespeare, an entirely different approach to facilitating the rebirth of tragedy was taken in Italy. Jacopo Peri, in the preface to his Euridice refers to "the ancient Greeks and Romans (who in the opinion of many sang their staged tragedies throughout in representing them on stage)." The attempts of Peri and his contemporaries to recreate ancient tragedy gave rise to the new Italian musical genre of opera. In France, tragic operatic works from the time of Lully to about that of Gluck were not called opera, but tragédie en musique ("tragedy in music") or some similar name; the tragédie en musique is regarded as a distinct musical genre. Some later operatic composers have also shared Peri's aims: Richard Wagner's concept of Gesamtkunstwerk ("integrated work of art"), for example, was intended as a return to the ideal of Greek tragedy in which all the arts were blended in service of the drama. Nietzsche, in his The Birth of Tragedy (1872) was to support Wagner in his claims to be a successor of the ancient dramatists. Corneille continued to write plays through 1674 (mainly tragedies, but also something he called "heroic comedies") and many continued to be successes, although the "irregularities" of his theatrical methods were increasingly criticised (notably by François Hédelin, abbé d'Aubignac) and the success of Jean Racine from the late 1660s signalled the end of his preeminence. Jean Racine's tragedies—inspired by Greek myths, Euripides, Sophocles and Seneca—condensed their plot into a tight set of passionate and duty-bound conflicts between a small group of noble characters, and concentrated on these characters' double-binds and the geometry of their unfulfilled desires and hatreds. Racine's poetic skill was in the representation of pathos and amorous passion (like Phèdre's love for her stepson) and his impact was such that emotional crisis would be the dominant mode of tragedy to the end of the century. Racine's two late plays ("Esther" and "Athalie") opened new doors to biblical subject matter and to the use of theatre in the education of young women. Racine also faced criticism for his irregularities: when his play, Bérénice, was criticised for not containing any deaths, Racine disputed the conventional view of tragedy. For more on French tragedy of the 16th and 17th centuries, see French Renaissance literature and French literature of the 17th century. Bourgeois tragedy (German: Bürgerliches Trauerspiel) is a form that developed in 18th-century Europe. It was a fruit of the Enlightenment and the emergence of the bourgeois class and its ideals. It is characterised by the fact that its protagonists are ordinary citizens. The first true bourgeois tragedy was an English play, George Lillo's The London Merchant; or, the History of George Barnwell, which was first performed in 1731. Usually, Gotthold Ephraim Lessing's play Miss Sara Sampson, which was first produced in 1755, is said to be the earliest Bürgerliches Trauerspiel in Germany. In modernist literature, the definition of tragedy has become less precise. The most fundamental change has been the rejection of Aristotle's dictum that true tragedy can only depict those with power and high status. Arthur Miller's essay "Tragedy and the Common Man" (1949) argues that tragedy may also depict ordinary people in domestic surroundings thus defining Domestic tragedies. British playwright Howard Barker has argued strenuously for the rebirth of tragedy in the contemporary theatre, most notably in his volume Arguments for a Theatre. "You emerge from tragedy equipped against lies. After the musical, you're anybody's fool," he insists. Critics such as George Steiner have even been prepared to argue that tragedy may no longer exist in comparison with its former manifestations in classical antiquity. In The Death of Tragedy (1961) George Steiner outlined the characteristics of Greek tragedy and the traditions that developed from that period. In the Foreword (1980) to a new edition of his book Steiner concluded that ‘the dramas of Shakespeare are not a renascence of or a humanistic variant of the absolute tragic model. They are, rather, a rejection of this model in the light of tragi-comic and “realistic” criteria.’ In part, this feature of Shakespeare’s mind is explained by his bent of mind or imagination which was ‘so encompassing, so receptive to the plurality of diverse orders of experience.’ When compared to the drama of Greek antiquity and French classicism Shakespeare’s forms are ‘richer but hybrid'. Though rarer in modern day there are some who continue to embrace the genre of tragedy and have created many acclaimed works in the genre. An example of such a person is the Japanese writer Gen Urobuchi who has become world renowned for his tragic works, of which examples include Puella Magi Madoka Magica, Fate/Zero and Psycho-Pass. He himself acknowledges that he's a writer of tragedy and defines his work as such. He writes tragedies that derive from a variety of the classic traditions as well as modern takes on Shakespearean to Senecan to Greek tragedy. With Fate/Zero exemplifying the Greek model. Modern day directors and writers that have made tragic films and television programs and have cited the genre as an influence on their work, notable examples include Darren Aronofsky, Michael Haneke, Asghar Farhadi, David Simon, Kurt Sutter, and Louis C.K. Numerous books and plays continue to be written in the tradition of tragedy to this day examples include Froth on the Daydream, The Road, The Fault in Our Stars, Fat City, Rabbit Hole, Death of a Salesman, Thirteen Reasons Why, Requiem for a Dream, Revolutionary Road, Oscar Wilde's Salome and Victor Hugo's Les Misérables. Aristotle wrote in his work Poetics that tragedy is characterised by seriousness and involves a great person who experiences a reversal of fortune (Peripeteia). Aristotle's definition can include a change of fortune from bad to good as in the Eumenides, but he says that the change from good to bad as in Oedipus Rex is preferable because this induces pity and fear within the spectators. Tragedy results in a catharsis (emotional cleansing) or healing for the audience through their experience of these emotions in response to the suffering of the characters in the drama. According to Aristotle, "the structure of the best tragedy should not be simple but complex and one that represents incidents arousing fear and pity—for that is peculiar to this form of art." This reversal of fortune must be caused by the tragic hero's hamartia, which is often translated as either a character flaw, or as a mistake (since the original Greek etymology traces back to hamartanein, a sporting term that refers to an archer or spear-thrower missing his target). According to Aristotle, "The misfortune is brought about not by [general] vice or depravity, but by some [particular] error or frailty." The reversal is the inevitable but unforeseen result of some action taken by the hero. It is also a misconception that this reversal can be brought about by a higher power (e.g. the law, the gods, fate, or society), but if a character’s downfall is brought about by an external cause, Aristotle describes this as a misadventure and not a tragedy. The writer Bharata Muni, in his work on dramatic theory A Treatise on Theatre (Sanskrit: Nātyaśāstra, नाट्य शास्त्र, c. 200 BCE – 200 CE), identified several rasas (such as pity, anger, disgust and terror) in the emotional responses of audiences for the Sanskrit drama of ancient India. The text also suggests the notion of musical modes or jatis which are the origin of the notion of the modern melodic structures known as ragas. Their role in invoking emotions are emphasised; thus compositions emphasising the notes gandhara or rishabha are said to provoke "sadness" or "pathos" (karuna rasa) whereas rishabha evokes heroism (vira rasa). Jatis are elaborated in greater detail in the text Dattilam, composed around the same time as the Treatise. The celebrated ancient Indian epic, Mahabharata, can also be related to tragedy in some ways. According to Hermann Oldenberg, the original epic once carried an immense "tragic force". It was common in Sanskrit drama to adapt episodes from the Mahabharata into dramatic form. ^ The theory that Prometheus Bound was not written by Aeschylus adds a fourth, anonymous playwright to those whose work survives. ^ For more information on the ancient Roman dramatists, see the articles categorised under "Ancient Roman dramatists and playwrights" in Wikipedia. ^ a b Banham 1998, p. 1118. ^ Nietzsche 1999, p. 21, §2: ‘two-fold mood[…] the strange mixture and duality in the affects of the Dionysiac enthusiasts, that phenomenon whereby pain awakens pleasure while rejoicing wrings cries of agony from the breast. From highest joy there comes a cry of horror or a yearning lament at some irredeemable loss. In those Greek festivals there erupts what one might call a sentimental tendency in nature, as if it had cause to sigh over its dismemberment into individuals’. ^ Williams 1966, pp. 14–16. ^ Williams 1966, p. 16. ^ Williams 1966, pp. 13–84. ^ a b Taxidou 2004, pp. 193–209. ^ Deleuze & Guattari 1972. ^ Felski 2008, p. 1. ^ Dukore 1974: primary material. ^ a b Carlson 1993: analysis. ^ a b Brockett & Hildy 2003, p. 13. ^ Janko 1987, p. 6. ^ Brown 1998, p. 441. ^ Cartledge 1997, pp. 3–5. ^ Goldhill 1997, p. 54. ^ Ley 2007, p. 206. ^ Styan 2000, p. 140. ^ Taxidou 2004, p. 104: “most scholars now call 'Greek' tragedy 'Athenian' tragedy, which is historically correct”. ^ Brockett & Hildy 2003, pp. 32–3. ^ Brown 1998, p. 444. ^ Cartledge 1997, pp. 3–5, 33: [although Athenians of the 4th century judged Aeschylus, Sophocles, and Euripides "as the nonpareils of the genre, and regularly honored their plays with revivals, tragedy itself was not merely a 5th-century phenomenon, the product of a short-lived golden age. If not attaining the quality and stature of the fifth-century 'classics', original tragedies nonetheless continued to be written and produced and competed with in large numbers throughout the remaining life of the democracy—and beyond it". ^ a b Brockett & Hildy 2003, p. 15. ^ Kovacs 2005, p. 379. ^ Walton 1997, pp. viii, xix. ^ Lucas 1954, p. 7. ^ Ley 2007, p. 33–34. ^ a b Brockett & Hildy 2003, p. 43. ^ Brockett & Hildy 2003, pp. 36, 47. ^ a b Brockett & Hildy 2003, p. 47. ^ Brockett & Hildy 2003, p. 49. ^ a b Brockett & Hildy 2003, pp. 50. ^ Brockett & Hildy 2003, pp. 49–50. ^ "Lovati, Lovato de'", Treccani: Enciclopedie on line (in Italian). Accessed March 2013. ^ "Mussato, Albertino", Treccani: Enciclopedie on line (in Italian). Accessed March 2013. ^ Henry Hallam (1837) Introduction to the Literature of Europe in the Fifteenth, Sixteenth and Seventeenth Centuries. Paris: Baudry's European Library, p. 212. ^ "Del Carretto, Galeotto, dei marchesi di Savona", Treccani: Enciclopedie on line (in Italian). Accessed March 2013. ^ Headington, Westbrook & Barfoot 1991, p. 22. ^ Headington, Westbrook & Barfoot 1991, p. 178. ^ Miller 1949, p. 894. ^ Barker 1989, p. 13. ^ "Fate/Zero Light Novel Volume 1 Postface pages 234-236". issuu. Retrieved January 26, 2019. ^ "The Needle and the Damage Done: Requiem for a Dream". www.papermag.com. Retrieved 11 April 2019. I wanted to make a tragedy, in the classical sense, says Aranofsky. ^ Leigh, Danny. "Arts: Requiem for a Dream". www.theguardian.com. Retrieved 11 April 2019. Eighty percent of ticket sales across the world go to Hollywood movies, he points out, and because of that, people are almost brainwashed into expecting a catharsis. But anyone who's been on the planet long enough knows that, in the end, things seldom work out OK. That's what tragedy is about. And tragedy is an art form that's been killed by Hollywood. I mean, with Requiem, the catharsis is really there for the audience the day after they've seen the movie. ^ Jagernauth, Kevin. "Watch: Darren Aronofsky Talks Myth, Storytelling And The Value Of Tragedy In 7-Minute Video". www.indiewire.com. Retrieved 11 April 2019. ^ Nett, Seraina (June 2014). "Michael Haneke interview: Questions are more frightening than answers". uniavisen.dk. Retrieved 11 April 2019. These topics are also uncomfortable for me, that’s why I make movies about them! To provoke an emotional response is the essence of drama. The Greek tragedy is not funny. I choose topics that irritate or agitate me. The point is to create a feeling of concern or shock, to be made to feel something more profound than is the case in mainstream cinema. ^ M. Smith, Nigel. "Emotional Love and Modern Tragedy: 8 Insights From Oscar-Winning Iranian Filmmaker Asghar Farhadi at the Zurich Film Fest". www.indiewire.com. Retrieved 11 April 2019. Classic tragedy is the fight between good and bad,” Farhadi said. Citing “A Separation” as an example, he followed that up by saying, “The modern tragedy is the fight between good and good. We don’t know who is right. Both sides want to understand each other, but the situation pushed them to fight. ^ Gronvall, Andrea. "The Gronvall Files: Asghar Farhadi, Writer/Director Of A Separation". moviecitynews.com. Retrieved 11 April 2019. When I was working in theatre I was reading a lot of tragedies. But this kind of tragedy—if you want to compare it to the classic tragedies of the past—has one historic difference. In a classic tragedy, there is a war between good and evil, but in modern tragedies, the war is between good and good. In classic tragedies, you hope the bad guy dies, so you feel better. But in this modern tragedy, you don’t know which character you want to win, which one you want to lose, and you’re probably not going to feel good about either. There’s also another difference between the classic tragedy and the modern tragedy. The weakness–the Achilles heel–of the classic tragic hero comes from within himself. For example, Hamlet doubts too much. King Lear is not very with it. Macbeth is too hungry for power. But for the characters of the modern tragedy, their weaknesses don’t come from within themselves; they come from the environment, the pressure that the environment puts on them. ^ "The Wire: David Simon reflects on his modern Greek tragedy". 8 March 2008. Retrieved 11 April 2019. ^ "'Sons of Anarchy' Showrunner Kurt Sutter on the 'Heartbreaking' Finale (Q&A)". 10 December 2013. Retrieved 11 April 2019. Sutter talks to THR about writing the scene he describes as straight-up Shakespearean tragedy. ^ Maron, Marc (April 21, 2016). "Episode 700 Pt. 1 & 2 – Julia Louis-Dreyfus / Louis CK" (Podcast). WTF with Marc Maron Podcast. Retrieved April 11, 2019. ^ Sallis, James. "'The Dead All Have the Same Skin' by Boris Vian". www.latimes.com. Retrieved 26 January 2019. His great novel, "L'Écume des jours" ("Foam of the Daze"), is a tragedy of young love in which a woman dies of the lily growing in her lung. ^ Chapple, Tobias. "Books in Review: Froth on the Daydream by Boris Vian". www.litro.co.uk. Retrieved 26 January 2019. The characters aren’t meant to be real. But it’s also devastating when the novel central tragedy strikes – that all too real feeling of an unjust world that takes away as easily as it gives, and of people trying as hard as they can to be happy despite it. ^ Bernier, Kathy. "REVIEW: 'The Road' Is A Gripping Prepper Novel Full Of Tragedy, Struggle And Hope". www.offthegridnews.com. Retrieved 26 January 2019. ^ Meehan, Ryan. "The Frontiers of American Tragedy". www.thecrimson.com. Retrieved 26 January 2019. ^ "Young boy's death drives tragedy of 'Rabbit Hole'". www.ocregister.com. Retrieved 26 January 2019. ^ Bustin, Jeremy. "BWW Review: Cadence Theatre's RABBIT HOLE Examines Life After Tragedy". www.broadwayworld.com. Retrieved 26 January 2019. ^ Bradley 2007, pp. 114–56. ^ Hegel 1927, pp. 567–8. ^ Hegel 1927, p. 572. ^ Banham 1998, p. 517. Aristotle (1974), "Poetics", in Dukore, Dramatic Theory and Criticism: Greeks to Grotowski, Butcher SH, trans, pp. 31–55 . Barker, Howard. 1989. Arguments for a Theatre. 3rd ed. London: John Calder, 1997. ISBN 0-7190-5249-1. Benjamin, Walter (1998) , The Origin of German Tragic Drama, Osborne, John trans, London and New York: Verso, ISBN 1-85984-899-0 . Bradley, AC (2007) , Oxford Lectures on Poetry (repr ed. ), Atlantic, ISBN 81-7156-379-1 . Deleuze, Gilles; Guattari, Félix (2004), Robert Hurley, Mark Seem and Helen R Lane trans, "Anti-Oedipus", Continuum, New Accents, London and New York: Methuen, 1, ISBN 0-416-72060-9 . Hegel, GWF (1927), "Vorlesungen uber die Asthetik", in Glockner, Hermann, Samlichte Werke, 14, Stuttgart: Fromann . Miller, Arthur (February 27, 1949), "Tragedy and the Common Man", The New York Times (Dukore 1974, pp. 894–7). Nietzsche, Friedrich (1999) , Geuss, Raymond; Speirs, Ronald, eds., The Birth of Tragedy and Other Writings, Cambridge Texts in the History of Philosophy, Speirs, Ronald trans, Cambridge: Cambridge UP, ISBN 0-521-63987-5 . Rehm, Rush (1992), Greek Tragic Theatre, Theatre Production Studies, London and New York: Routledge, ISBN 0-415-11894-8 . Schlegel, August Wilhelm (1809), Lectures on Dramatic Art and Literature, Gutenberg . Williams, Raymond (1966), Modern Tragedy, London: Chatto & Windus, ISBN 0-7011-1260-3 . Taplin, Oliver; Billings, Joshua. "What is Tragedy?" (podcast). UK: Oxford University. .